OMG this things come the one after another . This time the Kinect transforms into a powerful 3d Camera. Yes this is true. UC Davis visualization researcher Oliver Kreylos fed the streams from his peripherals infrared and color cameras into a custom program that interpolated and reconstructed the result, generating a mildly mindblowing 3D virtual reality environment he can manipulate at will. Watch the videos and smile!! You can also measure virtual objects!! Hardware hacking again!! This time is the Xbox Kinect that fell into some hacker hands and like the Wiimote , they made some amazing things. Kinect is naturally a lot more complicated, but there’s also a lot of potential here, and we can’t wait to see what people come up with. Florian Echtler took that open source driver and hooked the Kinect into his own multitouch UI “TISCH” software library (which actually supports the Wiimote as an input already, funny enough). The result is a bit of MS Surface-style multi-touch picture shuffling and zooming, but it uses full body tracking instead of touchscreen input, of course.Take a look at the video .. If you have a Mac don’t worry. It has already ported . Can’t wait for the best things to come!! AAXA is known for making bright little pico projectors, and its newest, the M2, is the best. This latest model packs 110 lumens of brightness, XGA (1024 x 768) resolution — seemingly a first for the world of tiny projectors. It also has 1GB of built-in storage plus an SD card slot if you need to get serious. 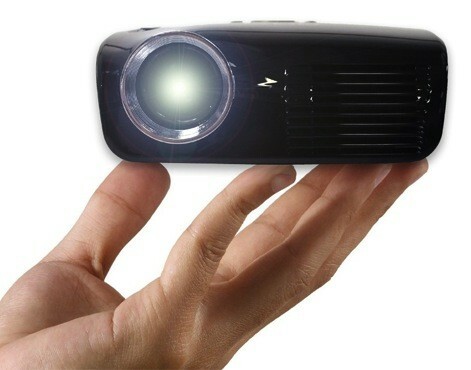 The micro projector also boasts VGA, HDMI, and USB ports. Other than that, the M2 has a built-in media player with support for MP4, MP3, AVI, JPG, and other file formats, and optional cables for iPod, PSP and smart phone hookups. AAXA’s M2 is available now, and you can grab one for $369. I am planning to get one. C-nario and AOpen, a leading small form factor (SFF) computer system manufacturer and a digital signage solution provider, today announced a partnership for the digital signage market. AOpen will integrate C-nario’s C-sign digital signage solution with its Digital Engine platform, and will market the integrated system to small and medium businesses (SMBs) across the United States. The integrated system will be launched at Customer Engagement Technology World (CETW), to be held November 10-11, 2010 at the Javits Convention Center, New York and the system will be displayed at AOpen’s booth (#421). AOpen’s Digital Engine is of course a compact and efficient media player, comprising various options, including TV tuner, Bluetooth, wireless LAN and mounting kits. Digital Engine offers a complete solution for digital signage applications, supporting high-definition video output. The system is shock and vibration proof, and it can be tailored to fit the user’s requirements. AOpen is the leader in ultra small form factor (uSFF) computing solution, and a provider of a complete array of digital signage technologies for streamlined, end-to-end solutions in consumer-grade environments. The company provides scalable technologies ranging from cost-efficient media players to Digital Engine™ and XC Mini flagship lines. AOpen also provides online content for download and content creation services, as well as cloud computing solutions. Here is another projection mapping project i found by luck in Vimeo while i was searching for time-lapse videos. I like it a lot and i want to share it . It’s in Frank Gehry IAC HQ and it is sponsored by Honda.